Every fortnight (two weeks) our editor sends along a few links with the most noteworthy quote from each article, a way of keeping our team abreast of what’s going on in the world around peer-learning, collective learning and knowledge sharing. We decided to share them alongside the magazine. You can read them here or subscribe to the Tinyletter and get them straight to your inbox. Smart libraries hold the potential to make Netflix-like content recommendations based on student outcomes or faculty preferences. Selected materials can then be pushed to the appropriate course site via the LMS. By mining their deep collection of content, tomorrow’s libraries will present the most relevant materials to instructors, enabling them to efficiently and effectively search, discover, and select the best sources to help students succeed in their courses. This isn’t science fiction; at the most advanced, competency-based institutions like Capella and Western Governors University, institutional research analysts are already using student engagement trends to develop personalized content recommendations based on a range of content qualities. In describing the new venture, Cox said Facebook was impressed with the Summit Public Schools’ academic performance and experimentation, particularly its use of teacher-created materials, its avoidance of lecture-based instruction, and its efforts to use technology to help students explore their long-term academic goals and interests. Facebook assigned a small team of engineers to help Summit improve the personalized-learning system. Yet the platform is operating as a “completely separate” entity from the company and will not require users to have an account through the social-media platform, Cox said. Kio Kit, a fantastic field kit for classes in Africa with tablets and a BRCK. 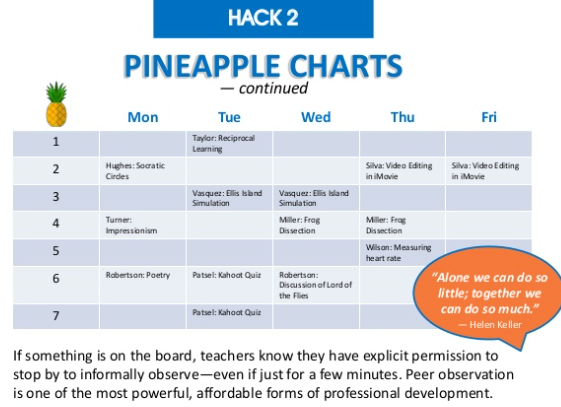 The pineapple chart is a simple system that facilitates peer observation.